While you can still order from Amazon (until 12/20 if you're a Prime member) and a few other stores and get your package before Christmas, the shipping deadline for most websites have come and gone...and you still need another gift. Don't despair! We have tons of amazing local stores, restaurants, and attractions offering Christmas gifts for everyone on your list. 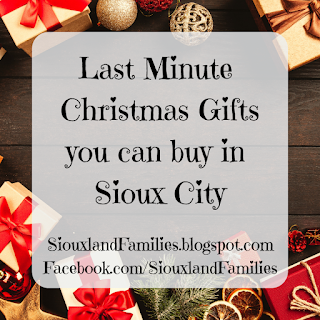 Here are my top picks for last minute Christmas presents you can buy in Sioux City. Across the street from Sertoma Park, Thinker Toys is commonly known as "the toy castle". The insides are as delightful as the outside, with a huge variety of toys from great brands. A few of my favorites are Corolle dolls, Calico Critters, the train room and Lego room in the corners, and the puppets. You'll also find Playmobil, Melissa & Doug, Alex toys, and lots of unique brands you'll love. Between Hy-Vee and Shopko on Hamilton Boulevard, Book People is full of delightful books for all ages, along with a small selection of toys and games. Wide variety of comic books for all ages and interests, plus tons of geekery for the fandoms your friends and family love. The LeMars location of this local learning store is closing, so everything at the Sioux City store is 25% off, and everything at the LeMars location is 25-75% off. They do have tons of classroom tools, curriculum, etc for the teachers on your gift list, but they also have lots of fun coloring books and tons of Melissa & Doug toys, board games, Lego education sets, and much more. Check their Facebook page or website to stay up to date on their sales as the closing happens. Find a variety of delicious flavored popcorns and gift baskets at this boutique store that uses fresh popcorn from the Jolly Time factory and takes it to the next level! I have never had a flavor there I wouldn't be happy to get a whole bag of, but I would especially recommend the Sioux City 50-50 mix if you're not sure what to get! Find bulk bins of a wide variety of candies and nuts, plus many pre-packaged options. Most of the candy here is fresh from the Palmer's factory! Some of my family's favorites are the cherry sours, reindeer corn, and chocolate covered pretzels. The Sioux City Orpheum will be home to live performances of Finding Neverland on December 26th and the Sound of Music on January 21st and 22nd. Both one-day passes and annual memberships which cover admission and most of their programming other than holiday parties would be great gifts! Choose from daily admission passes and annual memberships which cover admission to the museum and grounds and in 2018 included their monthly Saturday storytimes as well. There are tons of other great options, but these are some of the best bets in Sioux City for last minute Christmas presents that are sure to delight your loved ones this holiday season. Happy shopping!